Sooner or later, everyone goes to the zoo. I know it has only been 3 days since I started my new job, but I am in L-O-V-E! The staff here is awesome, I am third in command, the office that I am in has cathedral ceilings and a massive double pane window, and the second day I was here, the culinary students brought me homemade chocolate donuts as a welcome present. Um, awesome. I am convinced that this is God's way of rewarding my patience with staying with the old company and putting up with SK's bs for so long. So glad you liked my invite. I designed and assembled it myself. I had them printed by one of Dirty's printing guys and bought the pocketfolds online. I think I may be changing the design and the colors a bit. 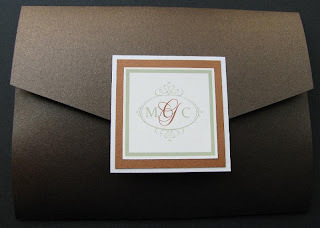 That invite is a pain to put together, with the ribbon and different layers, and takes a lot of time, so I may just skip the ribbon and re-do the monogram. I think that this may turn into a nice little side business... Etsy here I come. lol. Oh and we finally booked our Honeymoon. We are going to Curacao for 14 days. Getting married during hurricane season really limits your choices. So we are doing 7 days at the Kura Hulanda Lodge in an Ocean Front Suite, and 7 days at the Baoase Luxury Resort in an Ocean Front Suite. Is it bad to say that I am looking forward to the vacation more than the wedding? P.S: The best part about my new job is that the CEO of this said to me that she doesn't expect me to work for the entire day, that she is realistic about employees needing to do personal stuff at work, and that company doesn't believe in blocking any computer activity. What? Hulu at work? Ok, if you insist. Just got the hard copy sample of my invite. It is surreal and scary now. Let me know what you think. Obviously, I have done a bit of editing... gotta keep myself incognito, ya know? I'm curious to hear opinions. Its in 136 days. OMG. vom. The whole me not working for a while thing? Yeah, it ran its course after 2 weeks. I am just so freaking bored at home that I feel my intelligence slowly slipping away little by little. There are only so many Facebook games and so much Maury you can watch before you start re-evaluating. All the wedding stuff is done, just in debate mode with Dirty about a few little surprises for the reception, so I have been contacting some of the agencies that I was interviewing with prior to me leaving my old job. Wouldn't you know that the developed a position for me, at more than twice what I was making with Sk, with a sweet signing bonus and some other awesome perks; like free movie tickets on Fridays, gym membership, transportation and food. I took it. I start next week. It is so good for my confidence that something like this came along. Working with Sk, my skills and abilities were always put down, so I always thought I wasn't good enough for something like this. The whole vibe here is totally different. The Director is down to earth and so knowledgeable about things. Right off, she wanted to hear ideas that I had to change and mold the program into something great. So we were just talking and I said something, and Friday I found out that they have implemented it... under MY name. She didn't pull a Sk and take credit for the idea, which is something that I will need to get used to. So the 8 Ball will be coming with me on Monday. Wish me luck. It was a pig flying. So I had my last day at work and more than anything it felt surreal. Like it hasn't hit me that I can sleep late and bum around doing nothing for the near future. It's an awesome feeling... and kind of scary at the same time. The funniest part of the whole thing is that Sidekick called me into her office and APOLOGIZED to me. She basically told me that she was sorry for being an overbearing micromanager and that she should have promoted me when she got the chance, but she was intimidated by me and my rapport with clients and the rest of the staff. She apologized for undermining me and for taking my ideas and passing them as her own. She also said that if our positions were reversed she wouldn't have been so gracious as I was towards her. She seemed sincere, but I also took it with a grain of salt. So now I am free...and it feels good. This is the place where I rant, rave and occasionally make a funny joke. Welcome to my world.